Watch on the Rhine, written in 1941 by Lillian Hellman (and winner of the New York Drama Critic’ Circle Award in the same year) is a perfect combination of drama, old-fashioned comedy and historical storytelling. The audience is seated in an intimate and well-to-do living room. Pillows and blankets are in the seats so you feel a guest in the home of the Farrellys, a wealthy family living in Washington, DC, in the 1940s. Mother Fanny (Paula Faber) lives with her son, David (Ian Hudgins), and they are eagerly anticipating the arrival of daughter Sara (Eden Casteel) with her family after her 20 years living in Europe. Also in the home are the shadowy houseguests The Count Teck de Brancovis (Charles Lafond) and his wife Marthe de Brancovis (Christine Pavao). 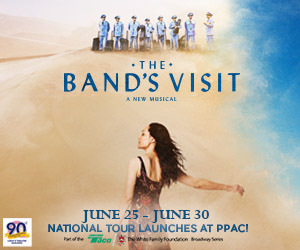 Upon the arrival of Sara; her husband Kurt Mueller (Andrew Stigler); and their three children Joshua (Ezra Jordan), Babette (Emma Sheldon) and Bodo (Jack Sheldon), we begin to learn of their time spent during the war. Clues of Kurt’s role in an anti-fascist movement are sprinkled throughout the house and it has Count Teck questioning on which side the Muellers stood. The matriarch, Mother Fanny, opens Act One with vulnerability, but does not let that detract from her sheer force. She commands the stage and wisely shows her emotional hand as a means to draw in the audience. Faber is raw, deeply talented and difficult not to watch when she is in the room. The man of the house since his father’s passing is David. Hudgins plays perfectly opposite the strong Faber. Without stepping on the toes of a moment, he is strapping and powerful with an ability to charm both the audience and his married houseguest, Countess Marthe. The relationships Hudgins creates with his family and love interest are authentic and warm; he is the safety everyone seeks, yet he is never too brash to achieve this authority. 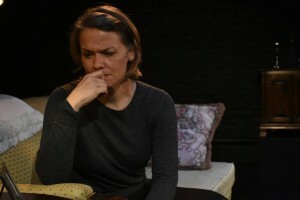 Daughter, sister and wife, Casteel plays her role brilliantly as the glue of this cast. She is breathtaking from the first time she enters the room in her bright red coat. Her storyline is the most complex; she must navigate seeing her family for the first time in 20 years, worrying about her husband and remaining calm and collected for her children. Casteel has a special way about her in this performance. Her emotions are easily read even when the spotlight is on someone else, and she drives the action forward by helping the audience react with her. Her husband is in clear danger of being killed as Count Teck begins to suspect he and Kurt are on opposing political sides, but Casteel grounds the show and brings comfort by sacrificing her own peace of mind. The play is performed in three acts, which can sound daunting, but every time the lights go to black signaling an intermission, it feels like only a few minutes passed. Acts One and Two build quickly and the script and performances are utterly engrossing. Act Three is the payoff act, with climactic interactions and major revelations, yet I was left wanting just a bit more after the action. Act Three felt like it needed a longer explanation of what this family will feel in the turmoil’s aftermath. It is a testament to the all-star cast that the story feels incomplete; wanting more of each relationship speaks to the depth created in them. The younger members of the cast add levity to the tumultuous home, and many of the best comedic moments come from Jack Sheldon, who has a true talent for one liners. The balance this show has for light-heartedness and intensity makes for a worthwhile night at the theater. The direction by artistic director Rebecca Maxfield shows great attention to detail and a clear understanding of how to draw the best from each of her actors. There may be a million shows playing right now, but prioritize this one.